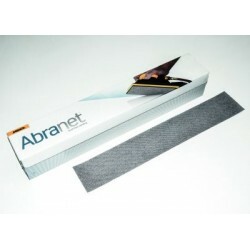 70mm X 420mm Abrasive Strips Abranet There are 5 products. Mirka Abranet 70mm x 420mm Sanding Strips P80 Each box contaiing 50 strips. Mirka Abranet 70mm x 420mm Sanding Strips P120 Each box contaiing 50 strips. Mirka Abranet 70mm x 420mm Sanding Strips P180 Each box contaiing 50 strips. Mirka Abranet 70mm x 420mm Sanding Strips P240 Each box contaiing 50 strips. Mirka Abranet 70mm x 420mm Sanding Strips P320 Each box contaiing 50 strips.